Our Santa Belt is made from one solid durable piece of American tanned high quality full grain Bridle leather. The width of the belt is 3.5”. The leather thickness is approximately 3/16” to 1/4” thick. The belt is available in black or dark brown. The edge of the Santa belt is beveled, burnished, and finished with an acrylic edge coat. Edge stitching is available as an option when ordering. The Santa belt can be ordered with or without a buckle. 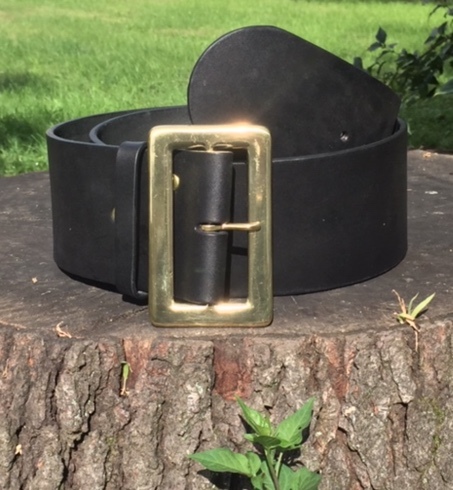 The buckle is solid brass and has a beautiful polished finish.The outside dimensions of the buckle is 2 3/4” X 4 1/2” and fits the 3.5” wide belt. 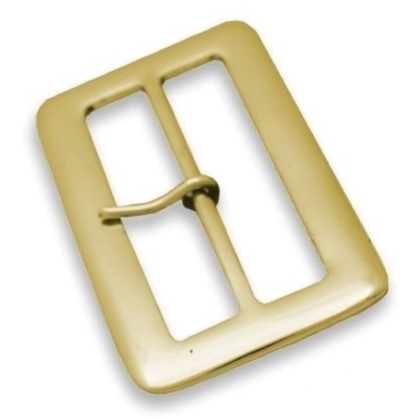 This is a very nice looking buckle and of high quality. I am sure you will be very pleased with this buckle. The Santa belt is available in sizes 45” to 67” center hole measurement. This measurement includes the buckle length (if ordering with a buckle) to the center hole. Seven holes are punched with three holes on each side of the center hole. If ordering a belt without a buckle the measurement is from where the belt folds over your buckle (ID) to the center hole. Please see measurement instructions for determining your center hole measurement here. Please measure. Base Purchase Price $95.00 US. - Please Select - 45" 46" 47" 48" 49" 50" 51" 52" 53" 54" 55" 56" 57" 58" 59" 60" 61" 62" 63" 64" 65" 66" 67"
By Ken Swift. Copyright © 2010-2019 Custom-Leather-Belts.com. All Rights Reserved.